Now translated to: German (Deutsch), French and Arabic. 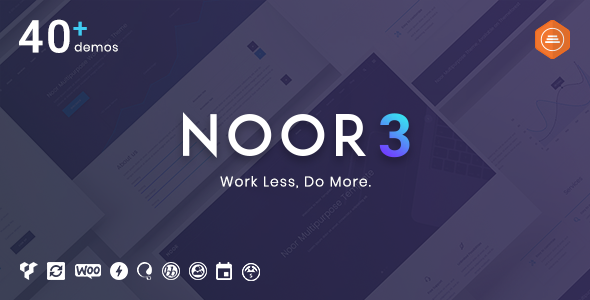 Noor is a minimal, versatile, responsive, height-performance WordPress theme with fresh creative design and Drag & Drop Page Builder that makes it easier to build beautiful WordPress websites. The theme is fully compatible with AMP (5x faster loading in mobile), WooCommerce (Online Shop) and WPML (translation ready). The theme is RTL ready (Arabic, Hebrew, etc.) and SEO optimized. Noor has more than 300 Elements & Modules with unlimited Layouts. If you are serious about your business or running a website, you probably know how important it is to create a creative website with Best Performance (SEO and Speed). The primary objectives behind Noor were to create easy to use unique Multi-Purpose WordPress theme. After more than a year in development, the objectives were achieved at a very high level of performance by experienced web design company PixelDima. AMP plays a significant role in driving more traffic to your site and provides a better experience to the mobile users. Noor comes with built-in support for AMP. All you need is to install AMP after installation of Noor, and you’re done. Noor is primarily built with speed and SEO needs in focus. With rich snippets and well-structured coding. Full support for the super popular Yoast Plugin. LazyLoad: Means images load when the image only as they enter the viewport. Compatabile with the popular cache plugin Autoptimize and WP Super Cache. bbPress is forum software with a twist from the creators of WordPress. Easily setup discussion forums inside your WordPress site. Noor-BuddyPress comes with slick Design so it looks just like the rest of your design. Easy to use interface in WordPress allows you to browse and preview each demo before you click to import. Blog in every demo theme is AMP valid and AMP ready. New demo added based on customer feedback and popular demand. These options are global and will apply to every page or post. Visual Composer, Slider Revolution includes For Free. New: Faster Google Fonts with Pre-connect. Update Noor Assistant: Now the default style of WPBakery can be used in the elements. Fix: featured Image on AMP post. New: Support for Caldera Forms. New: CounterUp support number of decimal and more ( You should check your old Counter). New: Option to make Navbar on mobile sticky/fixed. Add: New option to add a second-page title. Fixed: WooCommerce Variations on the admin dashboard. Fixed: Noor Plugin page on admin  dashboard. Add: Added a new demo "Digital Products". New: New option to the Customizer for changing the product layout. New: New option to the Customizer to show/hide the EDD cart on the menu. New: Support for Easy Digital Downloads - Related Downloads. New: Support for Easy Digital Downloads - External Products. New: Support for Easy Digital Downloads - Specs.